Leukoencephalomyelopathy (LEMP) is a juvenile-onset neurodegenerative disorder in the white matter of the central nervous system (CNS). Due to destructions of the myelin sheath, which protectively surrounds the nerve fibres, the nerve conduction is interrupted. Typical symptoms of LEMP are coordination and movement disorders. Only a few months after the first symptoms, the affected dogs will not be able to stand up or to walk any more. In the breeds Leonberger, Rottweiler and Great Dane, variants in the NAPEPLD gene have been identified to be associated with LEMP. NAPEPLD encodes for an enzyme of the endocannabinoid system, which seems to be involved in myelin homeostasis, CNS development and to have a neuroprotective function. The age of onset is about 1  3 years and the disease is inherited in an autosomal recessive manner. 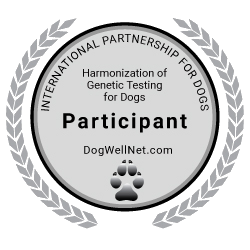 Since about 1% of the examined dogs without symptoms are tested as homozygous affected, it is assumed that the penetrance is reduced and the influence of modifier genes or factors is expected.